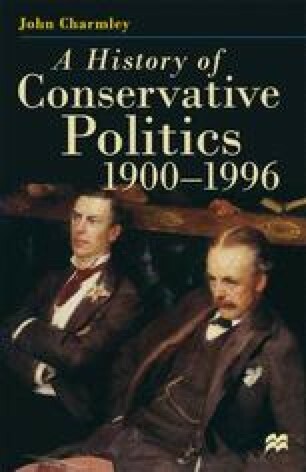 A distinction should be drawn between the philosophical and political roots of what became known as Thatcherism. Mrs Thatcher is the only British politician of the twentieth century to have had her name enshrined in an ideology, and because of this and her combative character it was easy for her critics to call her an ideologue; this is to miss the main point of naming a creed after the woman — which was that it was closely bound up with her personality. Hayek, Friedman and the Institute of Economic Affairs simply gave ‘substance and intellectual respectability to her beliefs and instincts, but most of these derive from her own experience and her idea of what is commonsense.’1 When she told the Party Conference in 1975 that ‘the economy had gone wrong because something had gone wrong spiritually and philosophically’, she was expressing her deepest feelings and those of millions who could identify with what she was saying; if Sir Keith told her that monetarism could help deal with this situation, all well and good. The personal nature of Thatcherism helps explain some of its contradictions.